A new lightweight cantilevered saddle designed in Ireland is promising to revolutionise saddle fitting and design. The new Bua Mark 2 saddle is the second major design around a cantilevered suspension from Bua Saddles, designed by Martin Ryan. The saddle’s tree is a piece of thermoplastic composite bent into a U-shape, a cantilever design, which effectively separates the unit into two different saddles. One part of the saddle is customised for the rider and the other side of the curved tree is designed to fit the horse’s back, allowing balance for the rider and comfort for the horse. There is a natural suspension as the two parts are joined at the front. 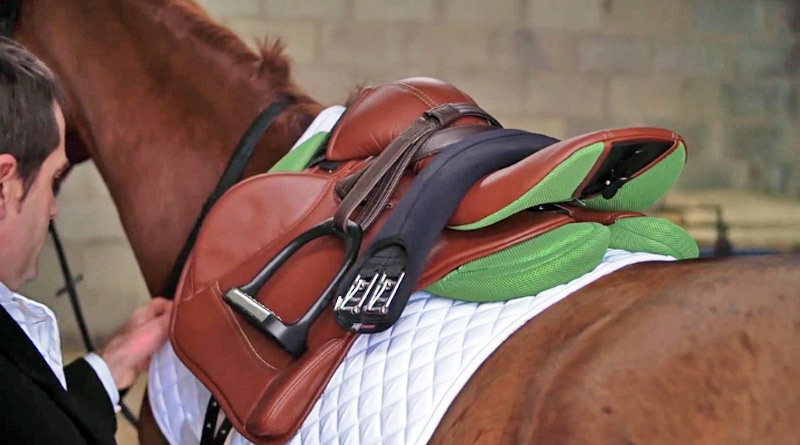 The latest version has interchangeable flaps, meaning the same saddle can be used for different disciplines. Ryan said many other sports had embraced technology and had experienced great performance gains. The Bua saddle frame being tested. Unlike other sports, such as golf or cycling, where new technologies have been embraced, the world of equestrian events has remained largely static, resulting in a saddle that has not changed for centuries. Martin Ryan with his new Mark 2 Bua Saddle. “Equestrian – great tradition in sport, but it hasn’t maximised the potential,” Ryan said. Launched in 2015, the Bua Cantilevered Mark 1 saddle is now being sold in 17 countries. A winner of numerous industry awards, the saddle is used by leading riders in a variety of disciplines. The Mark 2 incorporates new features making it suitable not only for showjumping and eventing, but also for endurance riding, Le Trec, para-riders and riding for the disabled, Ryan said. Ryan said the cantilevered design had become a popular choice with riders returning from falls or for those with back or leg injuries, as the cantilevered tree allows riders to stay more comfortable in the saddle for longer periods of time. At just 4.1kg, the Mark 2 saddle is said to be good for sport horses returning to work after back related issues. “More importantly the flexibility allows horse owners with a number of animals have a ‘ready to go saddle’ without constant flocking and adjustment as horses change in size and fitness throughout the competition season,” Ryan said. Ryan first started on his saddle design in 2005. The concept won its first award in 2006, the Dyson award / ISPO / Institute of Designers Ireland. I have a youngster who has sadly been diagnosed with kissing spine. He has had the ligament transection surgery and now follows some weeks of re-hab. Your saddle looks very interesting but I would like to know more about the part that is in contact with the horse – how wide are the bearing areas of the panels, do they flex at all with the horse, and what adjustments can be made to the tree in general as the horse changes shape? And of course – what is the price? The panels are very flat and flex and move with the horse. The gullet is not changeable but due to the design and the way it sits on the horse it fits a huge variety of horses. It really is a totally different style and fit to a “regular” saddle. I’d like to know how much the Mark 1 is? I’d like to know how much it costs and will it be available in Australia? I would like to get a price. I have 3 OTTBs and use A Genesis saddle. Have to constantly change for all three to fit.